« When The Children Cry…. 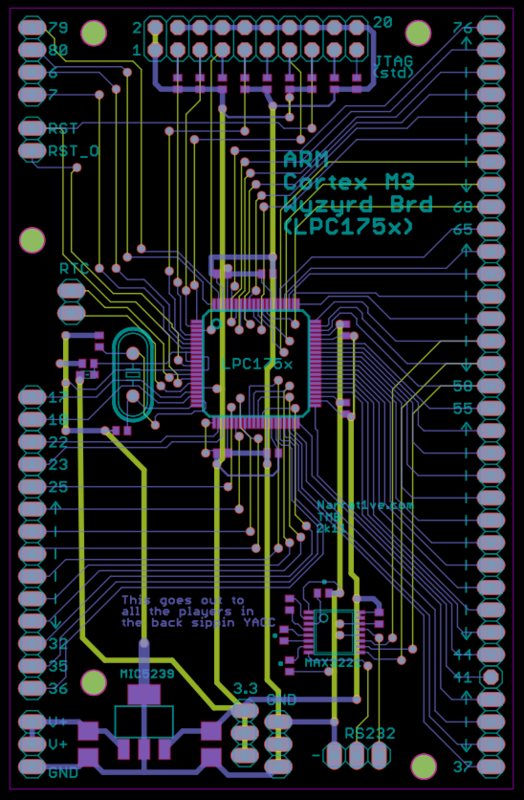 I had a slow week this week and laid out and ordered a “bare metal” PCB for an ARM Cortex M3 — the NXP LPC175x series. I spend too much time messing with 8-bit MCUs. It’s 2011 after all. I brought up an ARM7TDMI awhile back, and figured it was worth at least trying to stay current. One of these days I’ll populate this guy, and eventually hopefully even program it. This entry was posted on Wednesday, March 2nd, 2011 at 9:35 am	and is filed under Uncategorized. You can follow any responses to this entry through the RSS 2.0 feed. You can leave a response, or trackback from your own site.